Thank you for stopping in to view the notes from our show which aired on Sunday 2 March 2014. KaliSara and RevKess had a wonderful conversation about community events and festivals. Unfortunately, the gremlins decided that they wanted to have some fun as well. Thus the audio from RevKess’s end is chopping. For that we sincerely apologize. Between the weather, ancient wiring in his apartment, and other technical issues, there is nothing that could be done to fix the problem. That said, the conversation was full of wonderful information. As RevKess was prepping for the show he did a simple Google search for the term “2014 Pagan Festivals”. One of the first links to come up was an article at About.Com in their Paganism/Wicca section. More of an almanac than a listing of festivals, it has some very interesting information. A list of ancient festivals, mostly Greek; birthdays of important individuals in the Pagan movement as well as those who have had influenced on our lives – Joseph Campbell for example. RevKess noted that there is also a Nebraska based Druid group, Prairie Shadow ProtoGrove is based out of Omaha. Their Facebook group is currently closed to the public, but one can ask to join. Mama Gina – Grandmother Tree – (single, available through Reverbnation.com) Please note that RevKess misspoke after playing Mama Gina on the show. Her music is available through ReverbNation.com, NOT BandCamp. RevKess is pleased, no thrilled, to note that Mama Gina quotes his review of Goddess Kiss’d CD in the “press” section of her ReverbNation page. 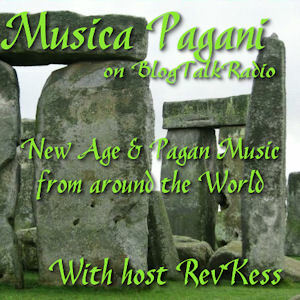 Listen to RevKess’s interview with Mama Gina on Musica Pagani.